If you’ve checked my facebook page recently you may have read that once upon a time in my life I auditioned for clown school. It’s true. And the real punchline is, I didn’t get in! In the larger context, this information was shared because of a weekend conference that I will attend in September (and no, it’s not a clown conference). The embarrassing truth came out because as I was filling out the application, it asked for a quirky/fun fact about myself. So racking my brain, I asked a friend of mine to share hers. She mentioned “clowns” and, of course, having somehow forgotten about clown school, it suddenly came back! And so I rushed to put it on the form…maybe I should’ve asked first how the information was going to be used. :). In yoga this duty or calling would be named dharma. We were born into this world for a purpose.. This calling is usually something that comes naturally to us, a love for something so strong, that if not fulfilled we may turn into ashes with the sunlight (vampire reference, sorry). So, the imperatives: movement and creativity. I have been blessed with circumstances that have allowed me to explore these areas in anyway I wish. A body that (besides sometimes being stiff) has carried me across finish lines, a mind that although sometimes is off killing monsters or feeding unicorns somewhere, is also compulsive in that if these imperatives are not met within a reasonable time will scream out and not rest until they are complete. I have a rich community of family, friends, and teachers who encourage, embrace, and sometimes kick me back onto the path of what’s important to me when I start making excuses. I have it easy compared to many. Many friends of mine have overcome severe illness with the help of a healthy lifestyle that includes movement and creativity: I was moved to tears at the starting line of an endurance event in Tahoe at the sight of veterans pulling their friends along in wheelchairs through a ten mile rough mountainous path. A dear friend, determined to not let diabetes get the best of her, started with a 5k race and completed her first triathlon in her mid-fifties. With the help of a healthy diet and lifestyle she got herself off of the medication. Yoga has practically cured two dear friends diagnosed with Multiple Sclerosis, who both chose the “easy” arduous path of diligently caring for their bodies and their minds through yoga instead of life full of daily injections. 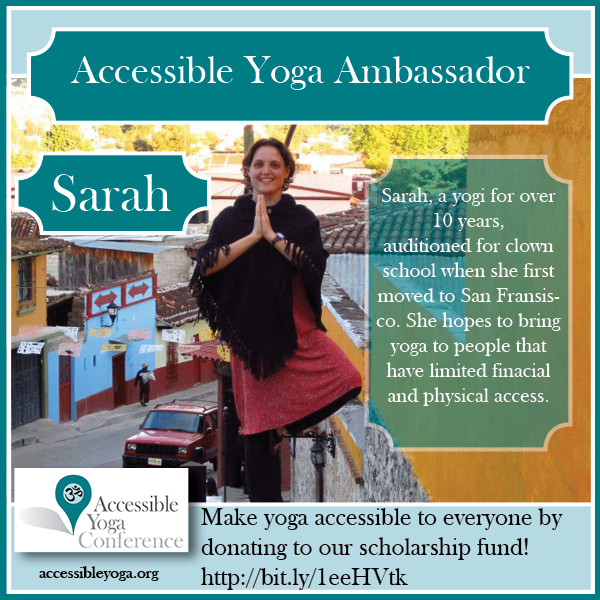 So that other yoga practitioners with limited financial resources may attend the conference, please consider making a donation. Click on this link to read more about the conference and contribute. 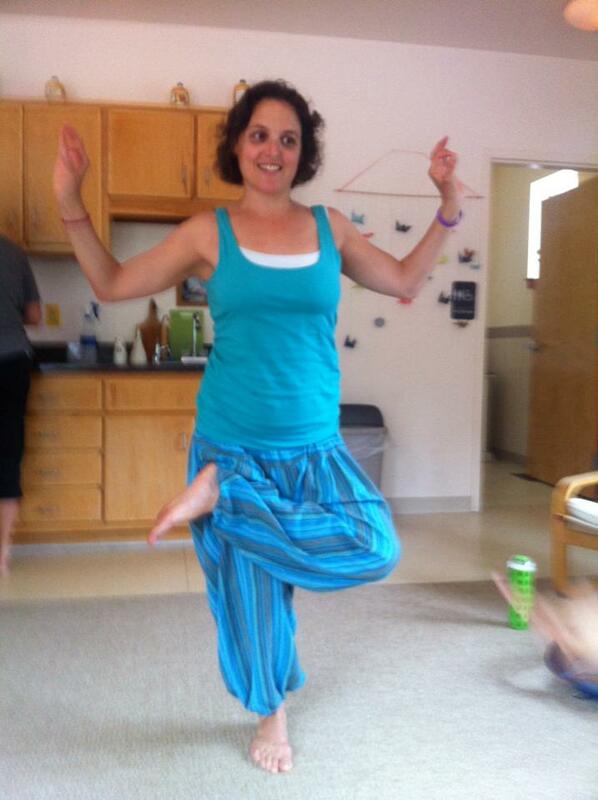 This entry was posted in yoga and tagged accessible yoga conference, california, clown, diabetes, exercise, multiple schlerosis, physical disability, yoga. Bookmark the permalink. I still love ya, BooBoo. Ya done good! Nice article. When you finish Buffy check out Orphan Black. I Love this! You are just amazing, and I so honor your honesty and sense of humor and depth of thinking and feeling, and…yes…gulp..even your love of Buffy the Vampire! I will think on an embarrassing truth and post it here-or not! Thank you for writing and posting this!!! !